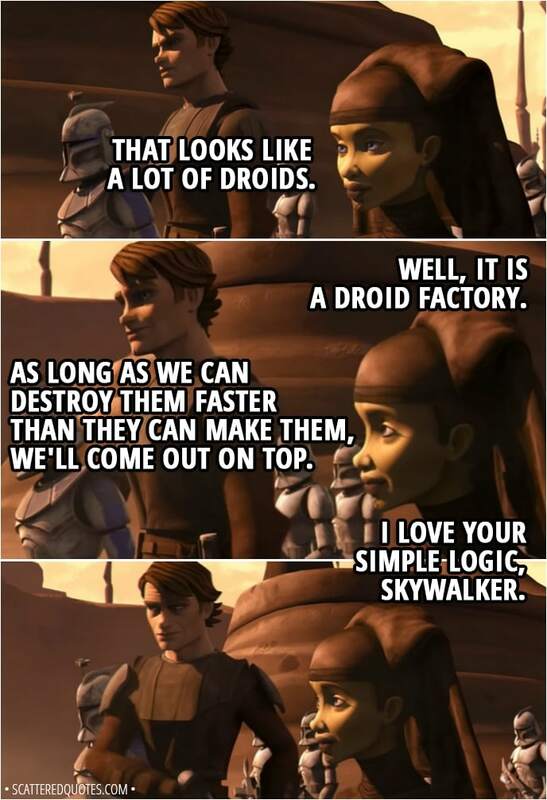 Enjoy the best quotes / moments from Star Wars: The Clone Wars’ episode ‘Weapons Factory’. Anakin Skywalker: Because it’s only after we neutralize the guns that we can push for the factory. Anakin Skywalker: And don’t forget to top off your energy cells and ration packs. Once we leave, there’ll be no resupply. Anything else, Ahsoka? Ahsoka Tano: No. I think you’ve pretty much covered everything in MY briefing. Anakin Skywalker: I wasn’t interrupting. I was trying to help you. Ahsoka Tano: Which I would appreciate, if you didn’t interrupt me to do it. I just think maybe you don’t trust me to give the briefing. Anakin Skywalker: It’s not about trust. It’s about getting the job done right. Ahsoka Tano: So you don’t trust me to get the job done right! I knew it! Ahsoka Tano: No. No, it’s okay. I understand. I’m the Padawan, you’re the Master. Luminara Unduli: At it again, are they? Luminara Unduli: Let’s just say that they have a penchant for playing loose with regulations and rules of command. Anakin Skywalker: Yeah, but when I say it, they actually listen to me. Ahsoka Tano: Well, if you don’t trust me, then maybe you should send me back. 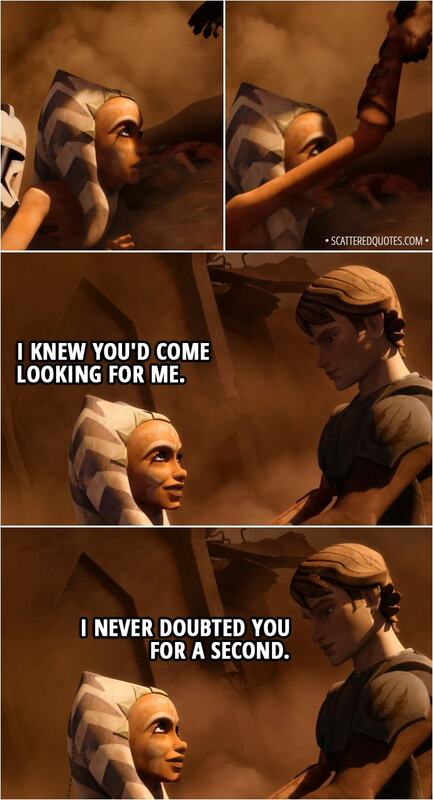 Anakin Skywalker: Don’t tempt me, Snips. Luminara Unduli: If you’re both finished with your little discussion, we do have a factory to destroy. Anakin Skywalker: That looks like a lot of droids. Luminara Unduli: Well, it is a droid factory. Anakin Skywalker: As long as we can destroy them faster than they can make them, we’ll come out on top. Luminara Unduli: I love your simple logic, Skywalker. Luminara Unduli: Be at ease, Skywalker. Anakin Skywalker: At ease? We need to act now! Ahsoka and Barriss may still be alive down there. Luminara Unduli: There’s not enough time. I sense them drifting away. Anakin Skywalker: No. We’ll get them out. Barriss Offee: Whatever you’re doing, I hope it works, because I’d sure rather have died fighting up there than starve to death down here. 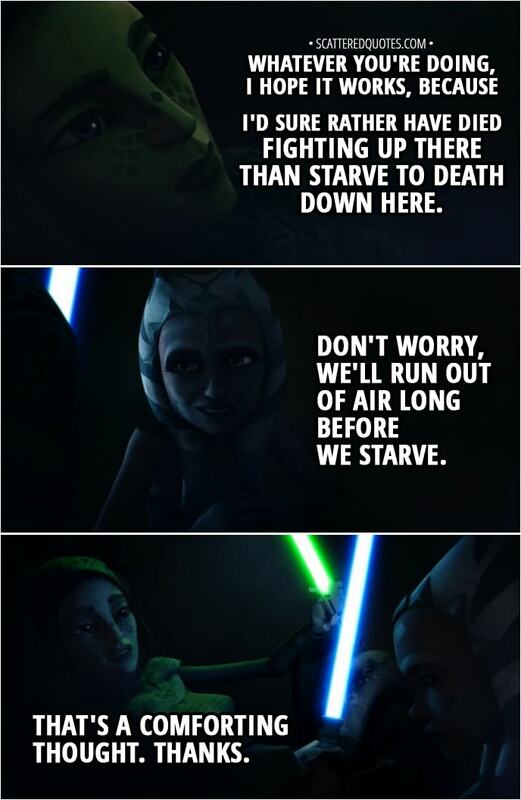 Ahsoka Tano: Don’t worry, we’ll run out of air long before we starve. Barriss Offee: That’s a comforting thought. Thanks. Anakin Skywalker: We cannot abandon our Padawans. Anakin Skywalker: I refuse to let Ahsoka die. She will find a way out. Luminara Unduli: If my Padawan has perished, I will mourn her, but I will celebrate her as well through her memory. Anakin Skywalker: Well, I still plan on celebrating this victory with my Padawan, in person. Barriss Offee: What happens to us now doesn’t matter. By destroying this factory, we’ve saved countless lives elsewhere. Ahsoka Tano: Well, I’m about to save two more. Anakin Skywalker: I knew they were still alive. I told you we shouldn’t give up on them. Luminara Unduli: It’s not that I gave up, Skywalker, but unlike you, when the time comes, I am prepared to let my student go. Can you say the same? Ahsoka Tano: I knew you’d come looking for me. Anakin Skywalker: I never doubted you for a second. • What did you think about this episode? • What is your favorite quote from it?